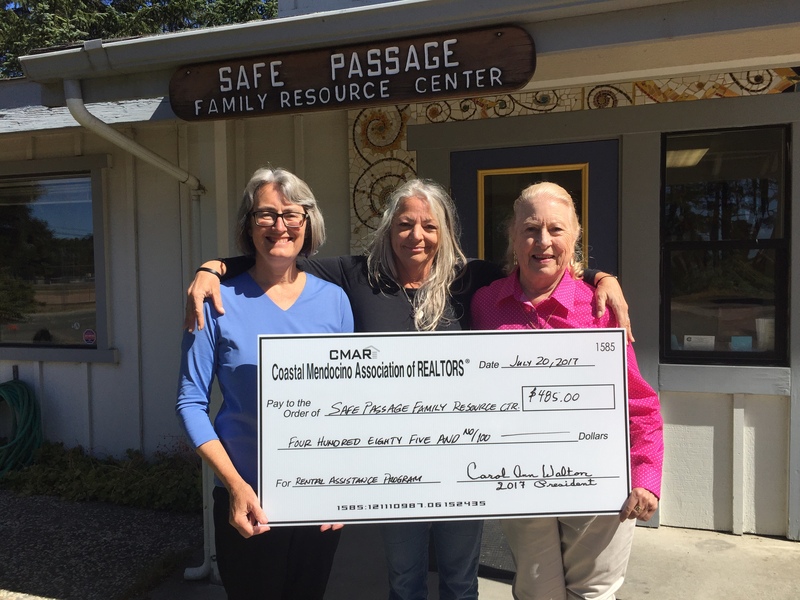 During the month of June, the Coastal Mendocino Association of REALTORS® (CMAR) raised funds to benefit the Safe Passage Family Resource Center’s special fund designed for rental assistance, to help families facing eviction. The money raised enables Safe Passage to provide assistance to Mendocino County families who are in danger of becoming homeless. From July 2016 through June 2017 the Rental Assistance Program was able to assist 45 local families. Safe Passage began providing services to families in 1996. They work closely with other local organizations to provide a variety of programs to assist families with many different issues and problems. Their ultimate goal is a community filled with safe nurturing families who have both children and parents who are happy and successful. Services offered through Safe Passage include information and referral about community resources, enrollment assistance for health insurance and other programs, transition assistance for Spanish speaking parents, parenting sessions, support and advocacy for parents of children with special needs and grandparents raising their grandchildren, support and information for pregnant women and new parents, monthly clothing giveaways, and much more! Photo: Safe Passage Director Laura Welter, Safe Passage Case Manager Laura Erskine and CMAR President Carol Ann Walton.